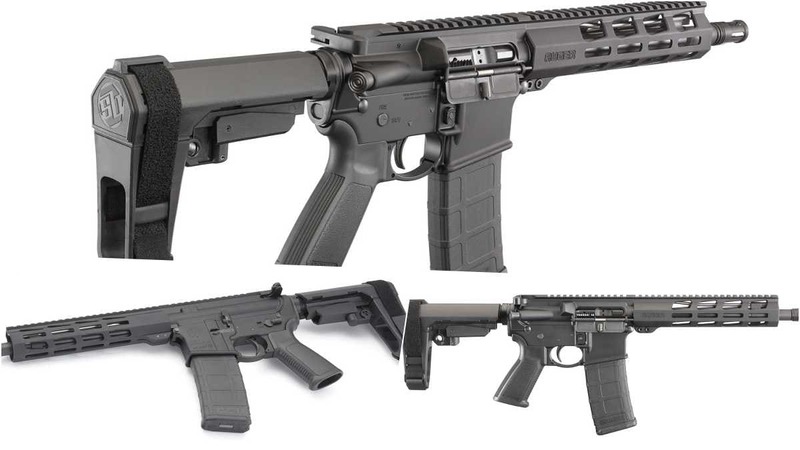 Complete with an SB Tactical SBA3 pistol brace, Ruger’s AR-556 handgun runs less than 28-inches long overall and complements their rifle line. The newest 5.56mm semi-auto offering from the Red Hawk-branded firearms powerhouse includes a 10.5-inch 4140 chrome-moly steel barrel inside a free-floated handguard slathered with M-LOK accessory slots. Tipping the scales at 6.2-pounds, the pistol uses a 7075-T6 flat-top upper with a forward assist and anodized finish. The 1:8 twist rate in the 10.5-inch barrel is billed by Ruger as stabilizing bullets from 35 to 77 grains, and the 5.56 NATO chamber allows the use of both 5.56 NATO and .223 Rem. ammunition. Suppressor ready, the barrel has 1/2x28TPI threads and comes with a factory-installed Ruger flash suppressor. The five-groove barrel uses M4 feed ramps and a 1-in-8-inch RH twist rate. The bolt carrier and gas key are chrome plated while the bolt itself is machined from 9310 steel. MSRP on the AR-556 pistol is $899, which puts it in the same neighborhood as the Springfield Armory Saint pistol and a good bit south of the Sig Sauer MCX Virtus handgun. Shipping with a single Magpul PMAG 30-round magazine, the pistol is neither California nor Massachusetts compliant.